British heavyweight Anthony Joshua (10-0, 10 KOs) will need to take some time off to heal a back injury he sustained in his last fight against Michael Sprott. The injury to the 25-year-old Joshua’s back means that his fight against American Kevin Johnson will be canceled for January 31st. Joshua has a stress fracture in his back from his 1st round stoppage win over the 39-year-old Sprott two months ago on November 22nd. Joshua did something during the fight that tweaked his back, and he’s been slow healing ever since then. It goes without saying that Joshua should have taken some time off from the gym rather than getting back into training recently. “I will be competing many times this year, but this injury is something that I need to get sorted as soon as possible,” Joshua said to Skysports.com. Joshua will be out of the ring until April 4th when he returns at the card at the Metro Radio Arena, Newcastle, Tyne and Wear, United Kingdom. There’s no word whether Joshua’s promoter Eddie Hearn will attempt to reschedule the fight against the 35-year-old Kevin Johnson or not. It’s a fight that would have been a good one for Joshua’s career development because the guys that Hearn has been putting in with him have been folding so quickly that he’s not getting much from the fights. 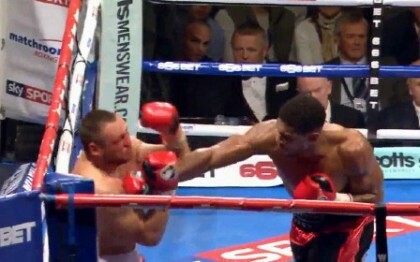 Joshua is a good fighter, but he’s probably not nearly as good as those knockouts would suggest. Hearn needs to step Joshua up against better opposition, because he wasn’t knocking guys out like this when he was fighting in the London Olympics in 2012. In the Olympics, Joshua barely beat all four of his opponents, and a lot of people think he lost two of his fights against Roberto Camarelle and Erislandy Savon. Joshua had the British crowd behind him in those fights, and it’s quite possible that the judges were influenced by the cheering for Joshua rather than what he was actually doing in those fights. But since Joshua has turned pro, Hearn has him fighting guys that are well below the fighters that Joshua was facing in the Olympics, and he’s now looking a lot better.